Matthias is one of the lesser-known apostles. He was appointed to the apostolic band to replace Judas, who betrayed Jesus and committed suicide. His appointment, and the qualifications for being an apostle, is found in Acts 1:15-25. An apostle has to be a witness of Jesus’ ministry from his baptism to his ascension, as well as a witness of the Resurrection. Two men met the requirements, Joseph Barsabus and Matthias. When you realize that there were a number of women present that met these qualifications but did not have their names put forward, it seems another qualification was to be a man. Details about Matthias are hard to come by. A very early tradition states that both Matthias and Joseph were part of the group of 70 (or 72) men Jesus sent out in Luke 10:1-20. All traditions agree that he died a martyr’s death, probably by a double bladed ax. The traditions give a number of choices for his field of ministry. Some suggest he went to Ethiopia; others say he went to Armenia, the first nation to adopt Christianity as a national religion. The most likely place for his death is at Colchis in Asia Minor, around 50 AD. The church of St. Matthias in Trier, Germany, claims the honor of being the final burial site for Matthias – the only one of the Twelve to be buried in Europe north of the Alps. 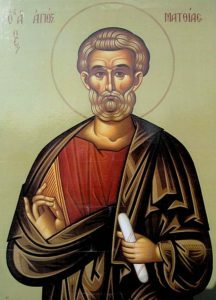 His Feast Day was one of the last of the Apostles to be added to the calendar, occurring in the eleventh century. No one seems to know why February 25 was chosen. Back in 1969 the Roman Catholic Church changed their remembrance of Matthias from February 25 to May 14. Most have not followed their example. Matthias served the Lord faithfully, but he was not one of the original Twelve. When his name was called, though, he was ready. Even after he was appointed to be one of the Twelve, he does not get directly referred to again in the Bible. So we too may serve the Lord far from the limelight. When we are called, Matthias reminds us to be ready. Even if our moment is only a moment, and then we serve the Lord for the rest of our years once more far from the limelight, we know that the Lord remembers our service. Matthias was a faithful servant of the Lord. If I allowed you five minutes, could you name the twelve apostles? Peter, James, and John we know. Oh yes, there is another James, and then there is Matthew. If you could mention the others, how do you explain the way the New Testament permits them to appear on the stage of history as if they had dropped from the clouds, only to vanish as abruptly as if they had fallen through a trap door? I should like to pursue this question a little further with you who have been summoned by the Lord and sent out by Him to serve, and discuss briefly the thought of The Glory of Obscurity. Your purpose as a twentieth century apostle is the purpose of any apostle of any century: to bear witness to the Light. From beginning to end, the true Hero of the Scriptures is not men; it is God. Men are important only as instruments and organs of God. Christ is the Vine, we are the branches, and without Him we can do nothing. Nothing! But He is by His Spirit the sole worker in the progress of His Church. He builds, He sanctifies, He glorifies. And He must remain our strength, our wisdom, and our righteousness, our all in all, our alpha and omega. We are channels; He is the flashing water of life. Ever since Christianity began, men have been talking as if it were at the point of perishing. But they leave Christ out of their reckoning. When you become conscious of your own weaknesses, are tempted to think of your tasks as heavy, or when you are complacent in your own power, or tempted to regard your task as easy, think of Him Who braces you for every duty and rebukes your easy-going idleness. Union with Him remains your only true strength, and oblivion of yourselves your highest wisdom. No doubt those apostles who have no place in history toiled honestly, did their Lord’s commands, yet oblivion has swallowed it all. They became partakers of the glory of obscurity. So will it be sooner or later with us all. Much of our work may go unnoticed and unknown. The memory of our service may live in the hearts of some few who loved us for a while, but will fade wholly when they follow us into the rest which remaineth to the people of God. The world has a short memory, and the saints of God can also forget. The apostle of any century is not destined to be a man of notoriety, but of obscurity. The big issue is one of faithfulness if we serve either at a conspicuous or obscure post in the Kingdom. We need to be careless of praise or censure, because God is our Judge; careless whether we are unknown or well known, because we are known altogether by and to Him. He measures excellence by the quantity and quality of love poured into our ministry. When the Church reaches that great moment of final triumph, the works these men did will be forever remembered. Though unrecorded on earth, they are written in heaven. But there is one other note of triumph for the apostle in obscurity. The faithful servant of his faithful Lord cannot be robbed of the blessings of faithfulness for the doer. Nothing done for Christ is ever wasted. What is done for Him leaves its mark on the doer. The act itself becomes its own benediction. The service is transformed into blessing. You cannot love another in the name of Christ and not feel the warmth of love’s rays. You cannot give a cup of cold water to the thirsty in the name of Christ without looking into His eyes. Prayer: Almighty God, who in the place of Judas chose Your faithful servant Matthias to be numbered among the Twelve; Grant that Your Church, being delivered from false apostles, may always be guided by faithful and true pastors; through Jesus Christ our Lord, who lives and reigns with You and the Holy Spirit, one God, now and forever. Amen.